WPT Poker employ the strictest anti-hacking security standards so you can deposit and withdraw your money with absolute confidence. WPT Poker is the online version of the immensely popular televised live poker tournament series called the World Poker Tour (WPT). It is the ideal online venue for online poker enthusiasts to play popular poker variants such as Omaha, Texas Hold’em, and Seven Card Stud in the form of exciting cash games and tournaments. Don’t forget to get your WPT Poker Bonus Code for a special bonusThe best online poker site for players to qualify for the WPT, WPT Poker has something for almost every online poker player in the world. The poker site holds freerolls, satellite tournaments, qualifiers, and other tournaments regularly to help players qualify for WPT events held worldwide. WPT Poker is licensed in Gibraltar and powered by Bwin.party Systems. The online poker room is committed to responsible gambling and fair play. Besides, players can rest assured that their private details, deposits, and winnings are safe and secure at WPT Poker because the online poker room uses 128-bit encryption solutions supplied by Thawte Security. 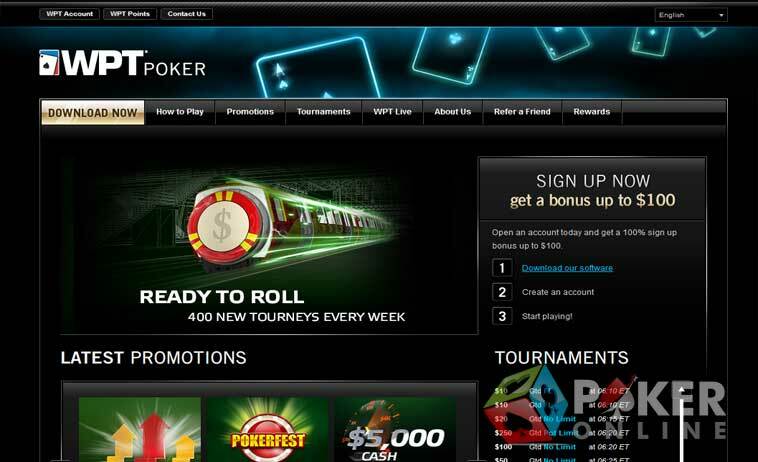 The online poker site also adopts a policy of zero tolerance for online fraud and cheating. WPT Poker welcomes newly registered players with a cash match bonus of 100 percent up to $100 on their initial deposits. The online poker room deposits this bonus into players’ real money accounts in 10 increments as and when they collect the required WPT Points. Besides, new players can win their share of more than $20,000 playing weekly freerolls at WPT Poker. The $1.5k New Player Freerolls is held on Saturdays at 14:00 ET, and WPT Poker encourages all new registered players to take part in this event. WTP Poker is home to several exciting promotions, challenging loyal WPT Poker players to qualify for prestigious live poker tournaments such as the World Series of Poker (WSOP), take part in leader board races, and win great cash prizes. For instance, WPT Poker challenges players to win their share of over $100k playing freerolls every month. WPT Poker rewards players who refer friends in the most generous way possible. Players can claim a Tell-a-friend bonus of up to $100 for every friend referred. Whenever the friend collects 60 WPT Points, both friend and player will receive a nice cash bonus of $10 up to $100 each. WPT Poker rewards real money poker gaming activity with points, which can later be exchanged for exciting bonuses and gifts. Whenever players play real money poker at WPT Poker, they will earn WPT Points. Players can spend these points at the WPT Points Store, which displays items such as real money, gift certificates, entries to tournaments, bonuses, and much more. Players will also be assigned a level in WPT Poker’s rewards system based on the number of points they collect per quarter. The loyalty scheme at WPT Poker comprises levels such as Bronze, Silver, Gold, Palladium, and Palladium Elite, with each level carrying its own collection of bonuses and benefits. Players can choose from two major types of tournaments at WPT Poker—Sit & Go Tournaments and Scheduled Tournaments. While Sit & Go Tournaments are available throughout the day and every day and begin as soon as the required number of players is seated at the table, scheduled tournaments begin at a pre-determined time and players are required to register for these tournaments in advance. A list of the different types of tournaments played at WPT Poker includes Sit & Go tournaments, multi-table tournaments, heads-up tournaments, and shootouts. The cashier system at WPT Poker is called Pay Pro, which allows players to deposit and play in several currencies. The cashier credits funds into players’ real money accounts in any currency they choose. Making deposits at WPT Poker is easy and safe because the online poker room is associated with a wide range of payment methods such as Visa, Visa Electron, MasterCard, Maestro, Entropay, Neteller, Skrill/Moneybookers, Click2Pay, Western Union, WebMoney, and Bank Wire Transfer. Each banking method is explained in detail on WPT Poker’s Help page, making it easy for new players to select the best banking method. If players have queries, comments, suggestions, complaints, and feedback, they can contact the customer care team at WPT Poker 24/7 through email and phone. 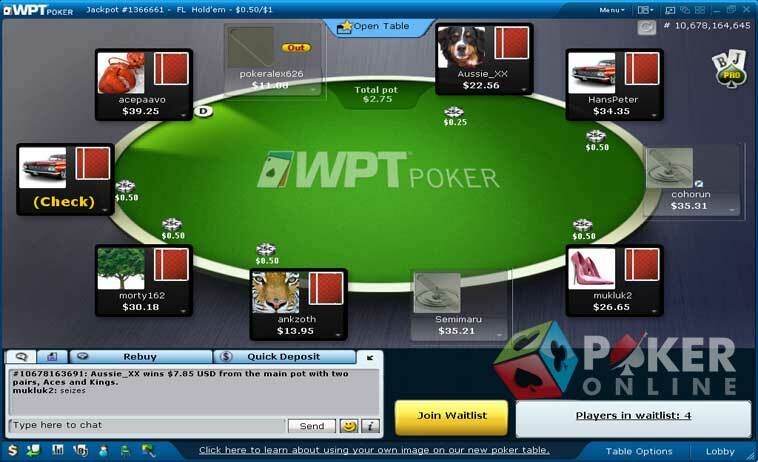 Besides, players can use the site map to easily navigate through WPT Poker. A comprehensive Frequently Asked Questions (FAQ) section provides answers to almost every query players might have. If players still need assistance, they can email to info@wptpoker.com or use the free phone number 00-800-7278-9118.